Another day, and another birthday celebration... this one rather belatedly. We trekked over to Neighborhood on short notice for a casual dinner, knowing full well that the spotlight of attention is currently on Fish School, David Lai's new venture with Yenn Wong which has just opened its doors to customers 2 nights ago. It was 6:30 p.m. and I was surprised to see David here at Neighborhood. When I asked him why he wasn't at the new place during its 3-day soft-opening period, he said that everything was "on track" over there and he wasn't worried. I love it when a chef is well-prepared and has confidence in his team! We're still just getting into the white truffle season, and the quality is on an uptrend. We were shown 2 pieces which were fragrant, and opted for the smaller piece weighing around 18 grams. Wagyu skirt steak tartare / Cantabrian anchovy - very nice, with good bite to the chunks of beef. Well-seasoned with little bits of peppercorn. Also tasty with the Cantabrian anchovies. With white truffle shavings on top... and yes, very tasty. Foie gras / sweet corn / hazenut truffle caramel - I liked this from my last visit a few weeks ago. I love sweet corn, and the chunks of foie gras terrine in the middle replacing the cobs are really creamy. The black truffle shavings and chunks of hazelnut don't hurt... and neither does the sweet caramel sauce. Nice little spicy kick from the chili. Red prawn / coco bean / shellfish stew - this was also very enjoyable from my last visit, but this time I ceded the head of the carabinero to our resident Big Head Shrimp... and even took a few pictures of her "eating herself (食自己)"... The different clams, the cuttlefish, and even the sea urchin tonight was better than usual. ...aaaand we mopped up the sauce with bread. ...especially with white truffle shaved on top! Yum! Hummus / vegetables - the carrots seem to have been roasted or dehydrated, giving them an interesting texture and flavor concentration. The hummus itself was very, very tasty... and I had to get extra bread as serving vessel to bring some more down the hatch. Those tiny baby radishes were cute and tasty. Pork belly / baby octopus / truffle vinaigrette - what a pretty dish! And tasty, too! Those slices of pork belly kinda reminded me of the Shanghainese sliced pork belly (白切肉) I grew up with, except better. The baby octopi were yum, and the dish was garnished with nasturtium flowers and leaves. The truffle vinaigrette was perfect for this. Baked macaroni / beef shank / mascarpone - this is always a crowd favorite... with chunks of beef shank and tendon at the bottom. Perfect way to end the savory part of the meal. Vanilla ice cream - and in truffle season, just order this and shave your white truffle on top! Let it snow! 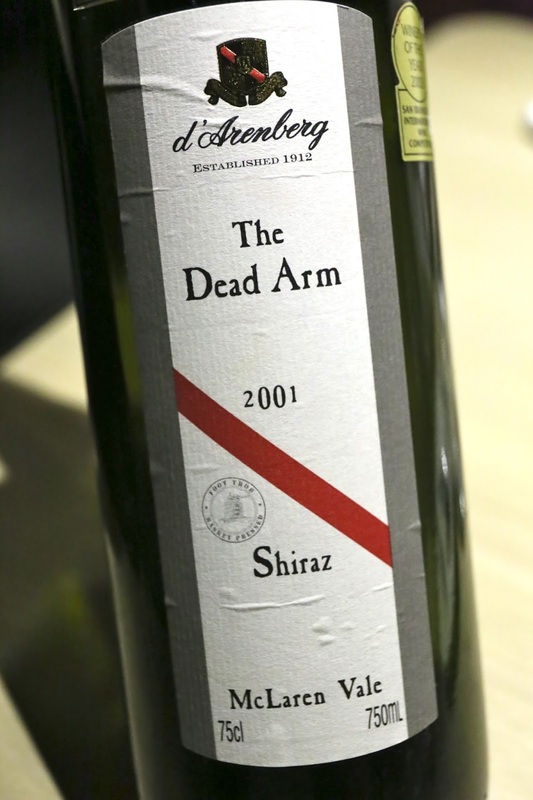 2001 d'Arenberg The Dead Arm - very heavy nose of coconut butter, exotic spices, and very, very sweet on the nose. Sweet on the palate, too. Tannins have softened but still a big wine. I'm very interested in hearing what you have to say about Fish School. I went there on their second night and thought the food was marvelous.